Red Spot Interactive (RSI) announced today the founding members of its Excellence in Patient Engagement and Practice Management Awards. These awards are given to elective health care practices that have consistently achieved patient satisfaction surveys in the top 10% of the country while at the same time generating in excess of $2,000,000 in patient lifetime value from practice marketing in less than 4 years. In today’s dynamic market of changing patient expectations accompanied by increased competition these practices have exceeded patient expectations during the patient engagement process while achieving the highest return on investment in practice performance. “The founding members of our Excellence in Patient Engagement & Practice Management Awards are clearly the top performing practices in the country in elective healthcare from both a patient engagement and practice performance perspective. These practices have shown four years of patient surveys that confirm the highest scores in patient engagement from inception of scheduling through to procedure and post care follow up. As well these practices have achieved the highest return on investment for both their marketing and practice administration investments,” noted Jason Tuschman, Chief Executive Officer and Co-Founder of RSI. “Our practice is honored to be a founding member of this award. My team has always started with the patient first in mind and by utilizing RSI’s platform we have been able to monitor and improve that process based on easy to understand real time patient surveys and practice performance metrics. 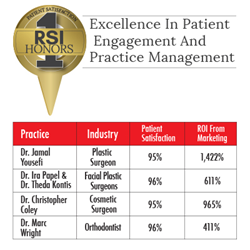 To know each day your patient’s satisfaction while at the same time improving consistently our financial performance from marketing and administration has put my practice in the best place possible,” stated Dr. Jamal Yousefi a plastic surgeon from Baltimore, Maryland. “My team is able to focus nearly 100% of their time and effort on the patient engagement process which allows us to achieve this award and continued growth. When you know your return on investment from marketing and practice administration is increasing each year I am allowed to spend most of my time as a doctor versus a business owner,” confirmed Dr. Marc Wright an orthodontist from Atlanta, Georgia. “Our patient satisfaction rates allow us to understand where to constantly focus for perfection in the patient engagement experience, with that and RSI’s marketing automation we are able to consistently achieve 50% or higher repeat patients within a year,” stated Dr. Theda Kontis a facial plastic surgeon from Baltimore, Maryland. Red Spot Interactive (RSI) increases elective healthcare practice profits through its proprietary analytics software, patient acquisition and retention automation technology along with marketing and patient scheduling call center services. RSI’s clients have generated over $100 million in new patient fees and 100,000 patient consultations since 2011. For more information, visit http://www.redspotinteractive.com.